Every now and again I do love to draw upon my past life as a Nicaraguan coffee farmer’s wife and whip up some tasty Latin American morsels. My kids go mad for them. As soon as I chuck the chorizo into the pan they’ll come running with a hopeful, “Are we having empanada’s for dinner?” The chorizo is the cheat ingredient that gives a tonne of flavour really simply. Traditionally you can shove pretty much any ingredients into them, including beans and eggs, but I find this recipe is the right mix of yum/simple/popular. Best yet, you can make this in several stages to suit your day. 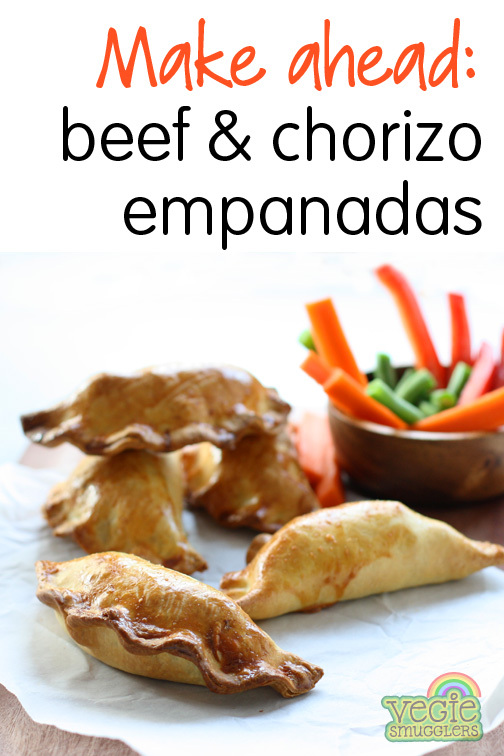 If you’re free in the morning then make the mince mix and even get the empanadas made up. Just cover them with cling wrap or pop them in a sealed container in the fridge until you need them. Then just preheat your oven, brush them with egg and you’re away. 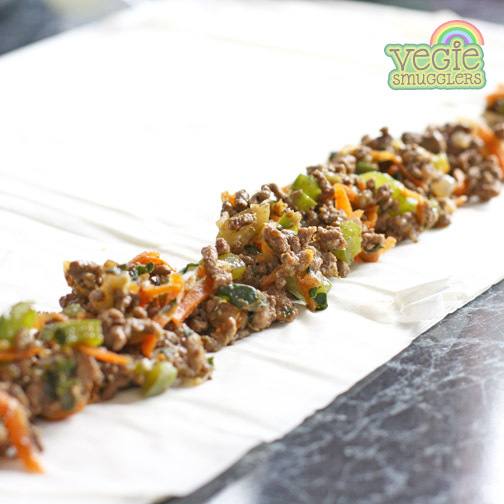 Besterest yeterest, this recipe makes a good amount so I’ve always got a ready-to-go bit of something for the lunchbox for the following day. Doesn’t matter that they’re cold – they’re apparently still completely yum. Heat a large frying pan over medium/high heat. Add the oil then the onions. Cook, stirring often for 5-6 minutes until starting to turn golden. Add in the chorizo for a minute or two then also carefully pop in the mince. Use the spoon to break up the lumps and keep it moving around for several minutes until it is all browned. Chuck in the garlic, capsicum, pumpkin & tomato paste. Stir everything through well. Simmer the mixture for about 5 minutes. Keep an eye on it – there’s not much liquid so make sure it doesn’t burn. 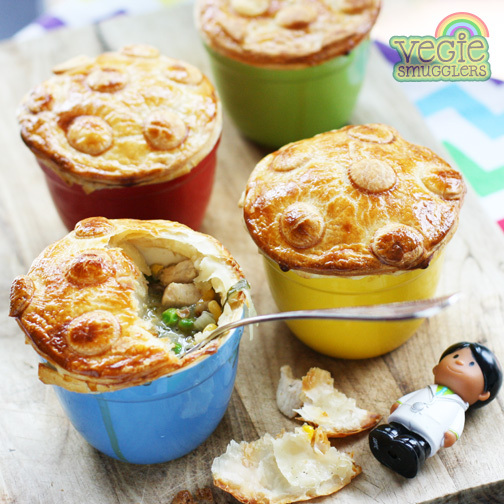 Tip in the peas – mix them through and take the mixture off the heat to cool slightly. Preheat the oven to 200C. Line a couple of oven trays with baking paper. Once the pastry sheets have thawed, use a small bowl or saucer as a guide and use a small sharp knife to cut four circles from each sheet (this gives a nice traditional shape but I’m not gonna fuss if this is all a bit hard & you instead use squares to fold into triangles). Brush half the edge of each circle with egg. Dollop about 2tbsp or so of mix into the middle of each circle. Fold over and seal the edges. Give them a crimp or just squish the edge shut with a fork. Place on the baking trays, brush with egg and bake for 25-30 minutes until golden. PS. After 5 years and 3 print runs, it looks like I’m about to sell out of the last hard copies of the original Vegie Smugglers cookbook. The good news? There’s still a handful left if you want to grab one quickly. The better news? There’ll be a digital version hitting your i-shelves soon. Sounds fancy, actually easy. And yum. By Thursday nights I am tired. The last commitment of the day is picking up big girl from Junior Guides at 7pm. And then we all pop on our jammies and flop together on the lounge for some quality food TV. Possibly the kids don’t give a toss about world cuisine, but the chance to stay up until 8.30 means they’ve got a new-found love of SBS travel/cooking shows. Over the past couple of years we’ve watched Adam Liaw tour Japan (I’m hoping to retrace his steps some day), Rachel Khoo relishing France and at the moment we’re enjoying Shane Delia travelling Turkey, which takes me back to my own travels there in the 1990s. I remember how new and exotic the flavours and smells were. As much as it pains me to contemplate them leaving, I hope my kids grow to be curious about the world and want to head off on their own adventures. To encourage them along, I’ve been enjoying making these burek, which sound fancy, but are actually super-simple family food. Just a savoury mince wrapped in filo pastry, coiled up and baked in the oven. 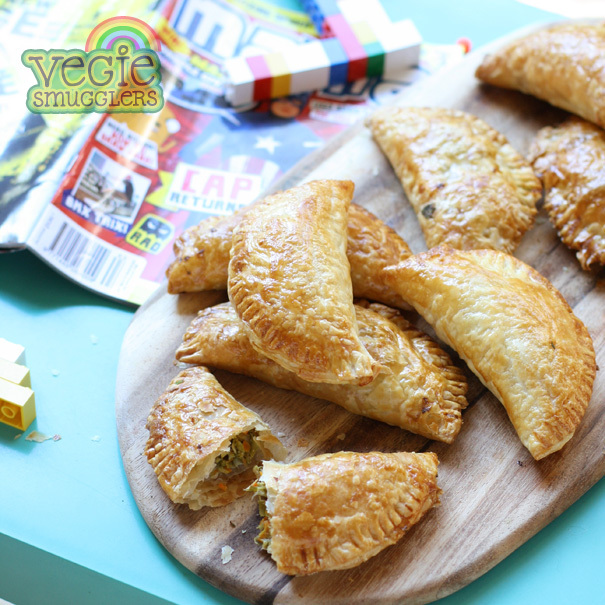 The kids just call them ‘fancy meatpies’, which isn’t so culturally sensitive but is pretty accurate. Schmancy meat pies. Sauce optional. You can make the mince ahead, to wrap and bake later in the day, or make these up and store in the fridge until it’s time to brush them with butter and bake for dinner. 1 egg, combined with a splash of milk for glazing. The key to success with filo is to make sure it is completely thawed (if frozen) and at room temperature. Then it’s pretty easy to work with. Heat a large frying pan over medium/high heat. Add the oil and pop in the onion. Cook, stirring often for 4-5 minutes until golden. Carefully place the mince in the pan. Use your spoon to break up lumps and totally brown all the meat (this take about 5 minutes). Add in the garlic and all the vegies for 2-3 minutes before scattering over the spices. Stir well and continue to move everything around regularly for 5 minutes or so. Move the pan off the heat and leave everything to cool for a bit (so that you can handle it easily). Preheat the oven to 200C. Find whatever round dishes you have – make several small bureks or one large one – totally up to you. Brush with the combined egg/milk and bake for 25 minutes until golden. If the filo bit sounds too hard (I promise it’s not), just scoop the mix into a dish, scrunch of some filo sheets and add them to the top, pie-style). Make a line of mixture along to whole length of pastry. Roll into a long cigar. 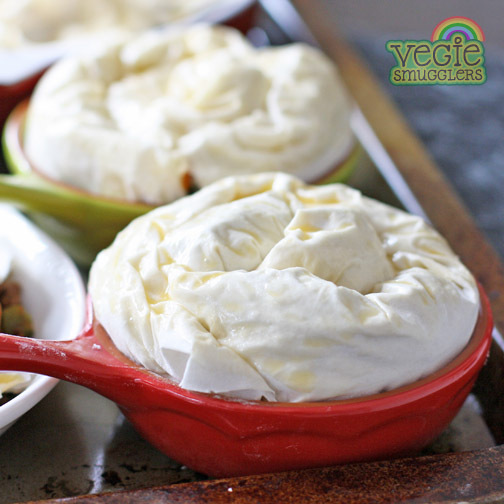 Coil and squeeze into whatever oven-proof dishes you have. Do your kids love each other? Love is all around, just not easily spoken about. Possibly suffering from an overactive fourth (heart) chakra the other night, I decided it was time for the kids to express their love for each other. Cosied up on my bed after bathtime, we snuggled away and I listed through my usual love chatter. It goes like this…. “No” they say in unison. And then we skew off into a discussion of theoretical mathematics and things descend into general confusion. “I love you sometimes… Mr M&P”. Mr M&P smirked his way through that exchange, but then it was his turn. Being a MASSIVE tell-people-you-love-them type (don’t come too close after I’ve had a few wines), I was slightly appalled at how difficult they found this simple task. I’m vowing to enforce more of a love-in so that they can share positive feelings naturally and without me around. So now I’m curious. Do you tell your siblings that you love them? And do your kids comfortably express love for each other? Preheat the oven to 180C. Line two oven trays with baking paper. Separate out your sheets of frozen pastry and leave to thaw. In a medium mixing bowl, combine the tuna, eggs, carrot, beans, spinach, herbs and cheese. Either cut each of your pastry sheets into four squares, or go all fancy and use a small saucer to help you cut out four circles. 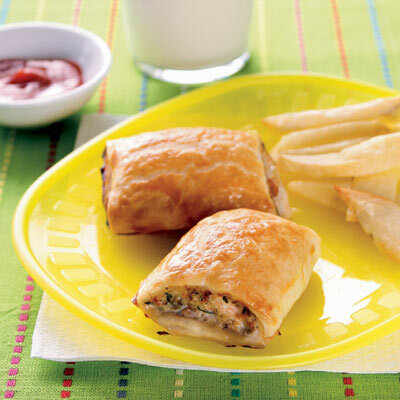 Divide the tuna mix between each of the 20 bits of pastry (ends up being about 2 tbsp per piece). Use a pastry brush to spread some egg mix over half the circle edge. Ease over the pastry. Seal with your fingers then press down on the edges with a fork to secure them. Pop onto your baking trays. Brush with extra egg. There are several universal truths when it comes to raising Australian children. 1. Getting them into and out of cars is going to be a painful and long-winded exercise. Shoes will be missing; toys lost and drink bottles astonishingly empty (and car seats wet). 2. The more disgusting the public toilet that you find yourself in, the longer your contented child will wish to languish (“the poo is almost here mummy”). And the bigger the incident, the fewer tissues you will have handy. 3. If they are to be struck down with a sudden and violent episode of projectile vomiting, it will be between 3-6am, usually just before you are due to do some incredibly crucial work thing. On a brighter note, it is also true that things covered in pastry are yummier and much more likely to be eaten by your delightful youngsters. Which is why the Vegie Smugglers cookbook features quite a few recipes making the most of the adored, yet not exactly healthy stuff. Being a mum, not a dietitian, I have the advantage of not freaking out at the idea of utilising some less healthy ingredients for the greater nutritional good. 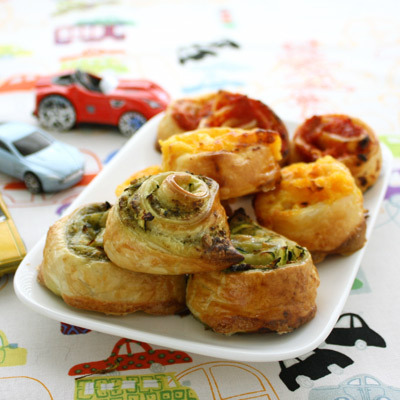 Puff pastry though, is very high in fat – even the 25% reduced fat stuff. 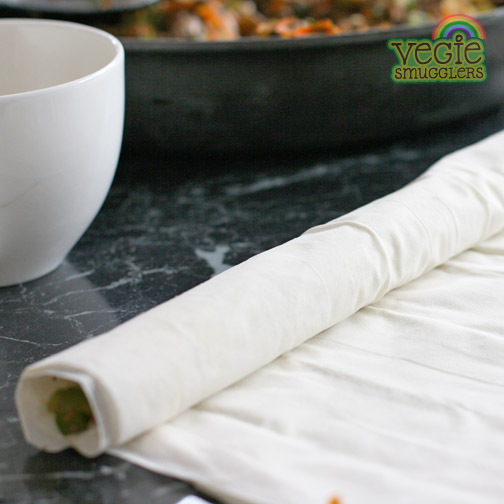 Use it occasionally and make sure that you make the most of it by cramming in all sorts of good ingredients – like my sausage rolls, which are full of mushrooms and lentils. (In the book I’ve got salmon pots full of broccoli and a fruit treat jammed full of apples, pear and prunes – which may help speed up your public toilet visits considerably). Today’s recipe is a glorious Indian-inspired dish. Just a hint of spice gets the kid’s palettes keen for more exotic flavour and opens the door to a whole new cuisine (unless you’re Indian, in which case you might prefer a bolognaise or lasagne for a bit of cross cultural goodness). 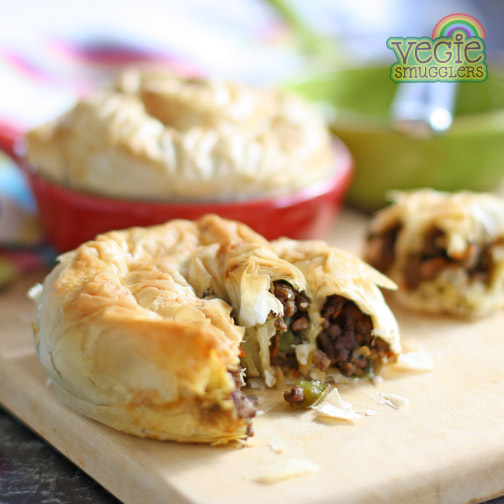 This mince filling is also good on baked potatoes and freezes perfectly for a couple of months. Heat the oil in a frying pan over medium-high heat. Add the onion and garlic and cook until onion is soft. Add mince and brown, breaking up lumps as you go. Add curry powder and all the vegies and mix well. Add the stock and soy sauce and simmer vigorously over medium-high heat until most of the liquid is evaporated and the vegies are soft. Season with pepper. Cut each pastry sheet into four squares. Place 2 tbsp of mixture in the centre of each square. Fold diagonally to create triangles, pressing firmly on the edges to seal well. Brush with egg and bake on oven trays lined with baking paper for 10-15 minutes until golden. 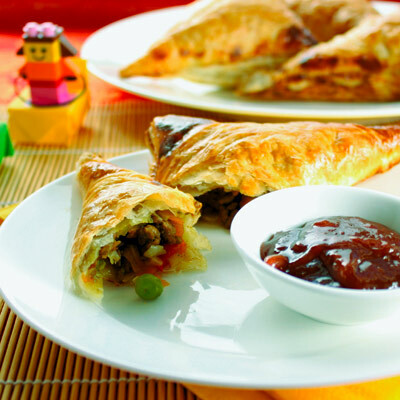 Serve beef triangles with chutney. It’s night after night of celebrations this week. Picnics, carols, swimming parties. It seems never ending. So to avoid the kids eating 16 straight meals of chocolate, chips and candy canes, these little swirls provide a vague notion of health on these balmy evenings. Stop, go, stop, go, stop go, slow down!!!!! Preheat the oven to 200C. Cover two baking trays with baking paper. Separate out the pastry sheets and leave to thaw. For the red: blitz together the capsicums and tomatoes. Spread over the entire pastry sheet. For the amber: blitz together the corn and carrot. Spread over the entire pastry sheet. Sprinkle cheese over the top. For the green: Spread the pesto over the entire sheet. Scatter over the grated zucchini. Use the plastic backing on the pastry sheets to help you roll them up into a swirl. Cut through the roll into 15-20mm slices. Place on the trays (so they look like little sushi rolls). Brush with egg. Bake 15-20 minutes until golden. 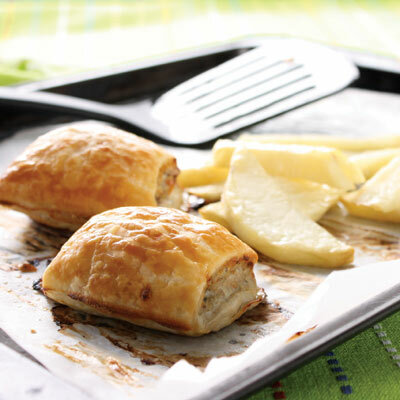 Anyone in Australia watching the current series of Masterchef last Friday night (about 1.5 million of us according to www.mumbrella.com.au) might have seen Gary whip up a ‘healthy’ kid’s sausage roll. Looked gorgeous and apparently tasted ok but I wasn’t impressed. Calling it healthy’ was a bit of a stretch. True. There were carrots in it. But to get them there, they were grated, slowly sauted, mashed, mixed with the meat and then baked. It’s a pretty popular way to smuggle vegetables into kids and one that I can’t quite get my head around. According to this method, at some stage during the day when I’m not doing the washing, cleaning, school runs, freelance work, buying the new undies because the old one were pooed in, unstacking the dishwasher, watering the plants that are gasping their last breaths and helping build the lego bird for ‘b’ homework, I’m supposed to cook vegetables to death and mash them. Some helpful books such as Jessica Seinfield’s ‘Deceptively Delicious’ recommend doing mashed vegies in large batches and freezing them in small portions ready to drop into tasty treats. So to successfully smuggle vegies I’m supposed to boil, mash, freeze, thaw and cook again. And will there be any ounce of nutrition left at the end of all that? Maybe you’re a nutritionist or food scientist and can let me know, but I’m suspecting not much. THIS is a sausage roll! Complete with carrots, zucchini and lentils. Preheat oven to 200C. Lay out your pastry sheets on a bench. Cut each in half to make 2 rectangles. Mix together all the remaining ingredients until combined. Spread the mixture lengthwise along the middle of the rectangles. Ease pastry over from one edge, brush egg along top side then roll other edge over to seal. If cooking immediately, cut each stick into 4 pieces, place on an oven tray lined with baking paper, brush with egg and cook in middle of the oven for 25 minutes until golden and cooked through. Cut potatoes into fries, toss in oil and cook at the same time. Prepare these quickly. Wrap uncooked sticks of sausage rolls in plastic wrap. Freeze immediately on oven trays to maintain their shape before transferring to plastic bags for an extra layer of protection. Defrost in the fridge (still wrapped in plastic) for 24 hours before cooking. Ensure they are completely thawed before cooking. Cut into four, brush with egg and cook for 25 minutes until steaming hot in the centre. And for a sweet pastry idea, try these apple & pear squares.